As we already know from media reports and hedge fund investor letters, many hedge funds lost money in fourth quarter, blaming macroeconomic conditions and unpredictable events that hit several sectors, with technology among them. Nevertheless, most investors decided to stick to their bullish theses and their long-term focus allows us to profit from the recent declines. In particular, let’s take a look at what hedge funds think about Koninklijke Philips NV (NYSE:PHG) in this article. Is Koninklijke Philips NV (NYSE:PHG) undervalued? Hedge funds are in a bearish mood. The number of long hedge fund bets went down by 1 in recent months. Our calculations also showed that PHG isn’t among the 30 most popular stocks among hedge funds. To most market participants, hedge funds are viewed as slow, old investment vehicles of yesteryear. While there are more than 8000 funds with their doors open at present, Our researchers choose to focus on the bigwigs of this group, approximately 750 funds. 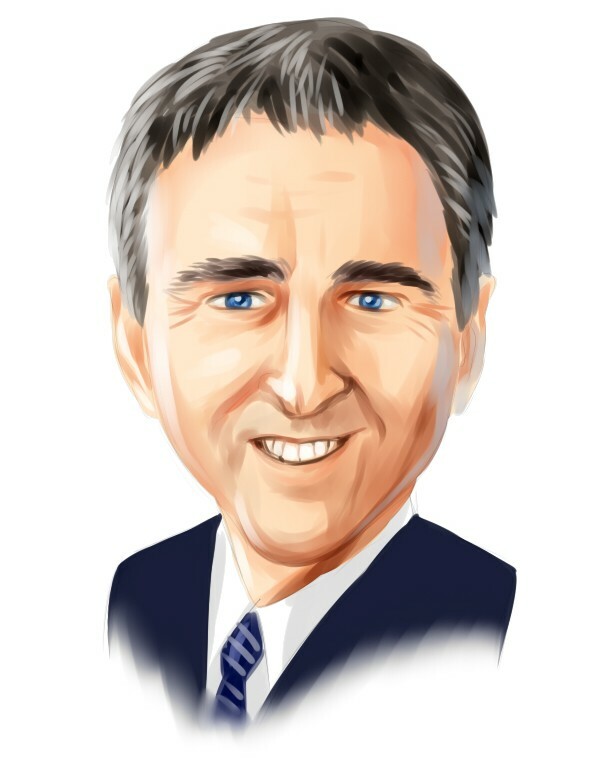 These hedge fund managers control the majority of the smart money’s total capital, and by shadowing their inimitable equity investments, Insider Monkey has figured out a number of investment strategies that have historically outpaced the S&P 500 index. Insider Monkey’s flagship hedge fund strategy outstripped the S&P 500 index by nearly 5 percentage points per annum since its inception in May 2014 through early November 2018. We were able to generate large returns even by identifying short candidates. Our portfolio of short stocks lost 27.5% since February 2017 (through March 12th) even though the market was up nearly 25% during the same period. We just shared a list of 6 short targets in our latest quarterly update and they are already down an average of 6% in less than a month. We’re going to take a look at the key hedge fund action surrounding Koninklijke Philips NV (NYSE:PHG). At Q4’s end, a total of 14 of the hedge funds tracked by Insider Monkey held long positions in this stock, a change of -7% from one quarter earlier. 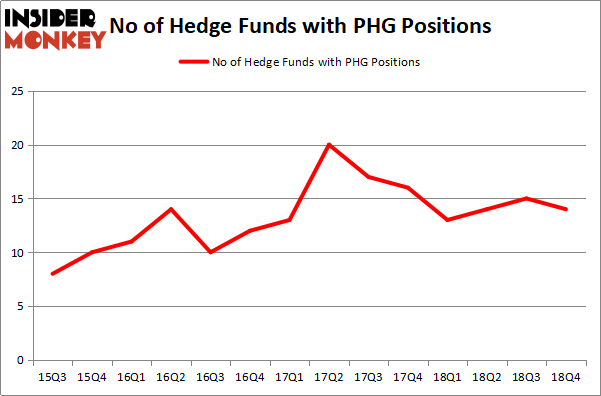 The graph below displays the number of hedge funds with bullish position in PHG over the last 14 quarters. So, let’s find out which hedge funds were among the top holders of the stock and which hedge funds were making big moves. The largest stake in Koninklijke Philips NV (NYSE:PHG) was held by Arrowstreet Capital, which reported holding $131.2 million worth of stock at the end of September. It was followed by Samlyn Capital with a $43.1 million position. Other investors bullish on the company included Two Sigma Advisors, Renaissance Technologies, and Beddow Capital Management. Seeing as Koninklijke Philips NV (NYSE:PHG) has witnessed a decline in interest from hedge fund managers, it’s safe to say that there were a few money managers that elected to cut their full holdings by the end of the third quarter. At the top of the heap, Robert Pitts’s Steadfast Capital Management cut the biggest position of the “upper crust” of funds watched by Insider Monkey, valued at about $48.6 million in stock, and Christopher Lord’s Criterion Capital was right behind this move, as the fund cut about $36.8 million worth. These moves are intriguing to say the least, as total hedge fund interest fell by 1 funds by the end of the third quarter. Let’s check out hedge fund activity in other stocks – not necessarily in the same industry as Koninklijke Philips NV (NYSE:PHG) but similarly valued. These stocks are Valero Energy Corporation (NYSE:VLO), HP Inc. (NYSE:HPQ), Analog Devices, Inc. (NASDAQ:ADI), and Travelers Companies Inc (NYSE:TRV). All of these stocks’ market caps are similar to PHG’s market cap. As you can see these stocks had an average of 31 hedge funds with bullish positions and the average amount invested in these stocks was $1499 million. That figure was $218 million in PHG’s case. HP Inc. (NYSE:HPQ) is the most popular stock in this table. On the other hand Analog Devices, Inc. (NASDAQ:ADI) is the least popular one with only 23 bullish hedge fund positions. Compared to these stocks Koninklijke Philips NV (NYSE:PHG) is even less popular than ADI. Our calculations showed that top 15 most popular stocks among hedge funds returned 19.7% through March 15th and outperformed the S&P 500 ETF (SPY) by 6.6 percentage points. A small number of hedge funds were also right about betting on PHG, though not to the same extent, as the stock returned 17.2% and outperformed the market as well.